When you venture out into the great outdoors, you can experience adventures that you cannot get anywhere else. It is exciting, it is fun, it is relaxing, and overall enjoyable. You can go hunting, fishing, hiking, and more. However, one part of being outdoors is not so pleasant for most people and that is answering the call of nature while you are nowhere near a toilet. There are a lot of toilets on the market today that claim to be ideal to take with you on the go. Some are high priced, others are cheap, but how do you really know which to choose? The Reliance Products Hassock toilet is affordable and and effective. 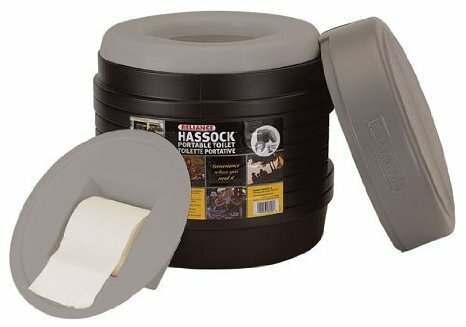 ​The Hassock is a completely portable, lightweight, self-contained toilet. This ensures that you will be able to use it no matter where you are when the urge hits you to answer nature’s call. Included with your purchase, you will get an Eco-Fresh packet to ensure that it does not stink up the tent or your boat. It is almost as comfortable as sitting on your home toilet thanks to the contoured seat. There is also an inner splash cover to ensure that you do not have to worry about wastewater splashing when you are moving the toilet around. It doubles as a toilet paper holder to keep all of your necessities within the self-contained unit. When it comes to emptying the waste, you will find a removable inner bucket. 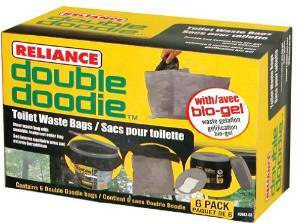 This bucket is compatible with the Reliance Products Standard Double Doodie bag. You must purchase the bag separately. This lightweight toilet weighs only 5 pounds when empty. It measures 14.7 x 14.7 x 154 inches to ensure you do not have to feel like you are sitting on a bucket. It also means that you do not have to rely on “squatting” somewhere. The Reliance Hassock toilet comes with a 5-year warranty against manufacturer defects. This means that you can spend a little money and know without a doubt that it will not fail you and your expectations. One of the biggest things people love about this toilet is that cleanup is as easy as lifting out a bag and tossing it into the trash. People often use kitty litter in the tank to help dry up the wet wastewater and keep the smell down. They do admit that the urine side of it smells slightly worse than the solid waste side. This is mostly due to the fact that urine has a natural, unappealing scent and solid waste smells worse when touched by urine. They like that it is able to hold a person regardless of size or weight, even if it does not at first look like a solidly built porta potty. The one major fault for this toilet is that it may not be as comfortable as the Camco or other options that feels more like a toilet. Additionally, there are many internal moving parts. There are hard plastic pieces that can break. If you take advantage of the warranty, you will not have to pay to repair it, but most people opt to simply throw it away and purchase another because it is one of the cheapest portable toilets available. All in all, the Hassock by Reliance Products, has a 4.3-star rating online. This should prove that most people enjoy the convenience and comfort that this toilet provides to them on their outdoor adventures. It is very affordable and does exactly what it is supposed to do. It gives you a place to relieve yourself if you are camping or on a boat and it definitely beats someone having to do it in a five-gallon bucket. Therefore, our opinion is, if you spend time in the great outdoors, you should probably consider this toilet. It could save you having to hide in the bushes. It could also keep you from having to go to shore just because nature calls. Isn’t that really all that is required of a portable potty?